One of my go-to recipes for summer picnics and barbecues is potato salad. I love a good classic recipe, but sometimes it’s fun to change things up a bit. The Internet is full of not-your-ordinary potato salads. I’ve found a bunch that I want to try and am sharing them with you today! 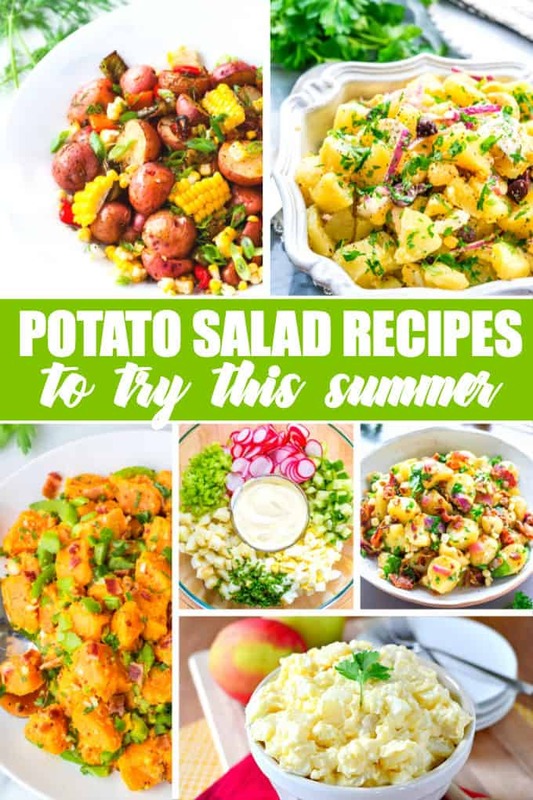 Check out these delicious potato salad recipes to try this summer. You’re welcome. What is your favourite way to make potato salad? Thank you for featuring my potato salad!! Hope you have a great weekend! OMG! So many to try! I love just a plain ol’ potato salad but certainly willing to try other recipes. These look like amazing potato salads. Summer wouldn’t be right without potato salad. Thanks for sharing all these yummy recipes. I made potato salad this weekend for the first time in ages – and it was soo good, now I’m on a roll for more! I’d love to try the The Ultimate Potato Salad it sounds delish! Thanks for featuring some that do not contain mayo! I am vegan and I usually make a simple potato salad with diced onions, peppers, and whatever veggies I have in the crisper then use either Italian dressing or red wine vinaigrette to dress it. Now I have ideas for something a little more exciting, like the Southwest Roasted Potato Salad. So many great great recipes will need to try! one of my very favorite things in summer is potato salad, thanks for all the recipes, I’ll have to widen my repertoire! I tend to stick to my mom’s classic potato salad recipe. These ones have inspired me to mix things up a little! Potato salads are filling, cheap, healthy, and refreshing!